After a fantastic time in Munich, it was off to the airport to head down to Rome. I'd never been before, so was looking forward to seeing what all the fuss was about! Despite being in one of their hubs, flights to Rome were exceedingly expensive on Lufthansa, so we ended up flying Alitalia (actually Air One - their low-cost carrier subsidiary). It wasn't a complete loss though, as Alitalia is one of Delta's SkyTeam partners, so I was able to earn a handful of Delta SkyMiles for the trip. Not quite as many as I got via the PetCareRx deal from a few weeks ago, but every little bit helps! The flight itself was pretty uneventful, though I was disappointed to find out at the last minute that they had changed planes on us, and the exit row seat I grabbed by checking in 24 hours before the flight was no longer an exit row seat. It was a short flight though, so I didn't really care all that much. We arrived at Fiumicino airport, and hopped in a taxi to head to the Hotel Eden in Rome. The Eden is a very nice, very old hotel in Rome - located a few minutes away from the Spanish Steps. 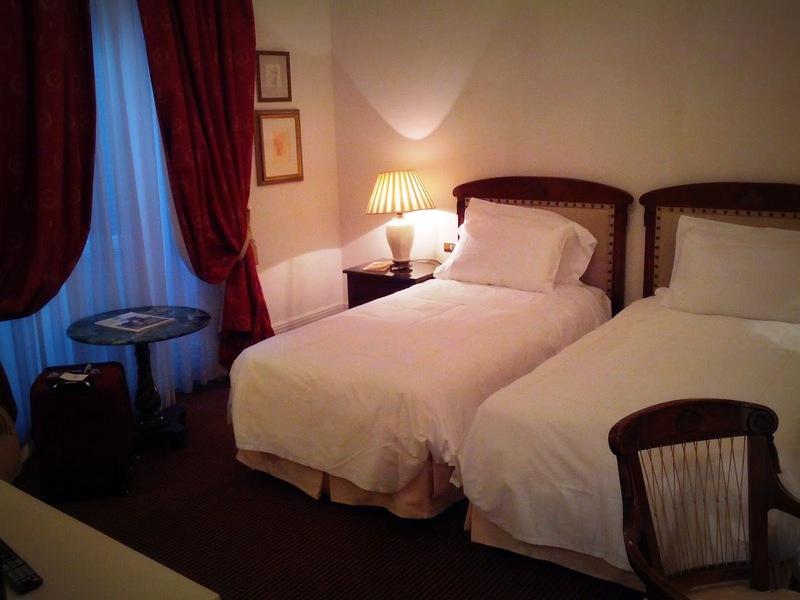 It is a Le Meridien hotel, and therefore part of the Starwood program (of course). Overall, I thought the room was quite nice - and the high ceilings helped to make it feel more spacious than the square footage might suggest. 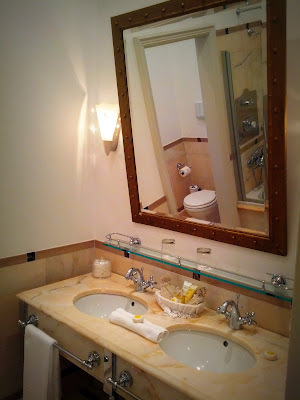 That said, there were a couple of elements that I found to be really frustrating during my 2-night stay. 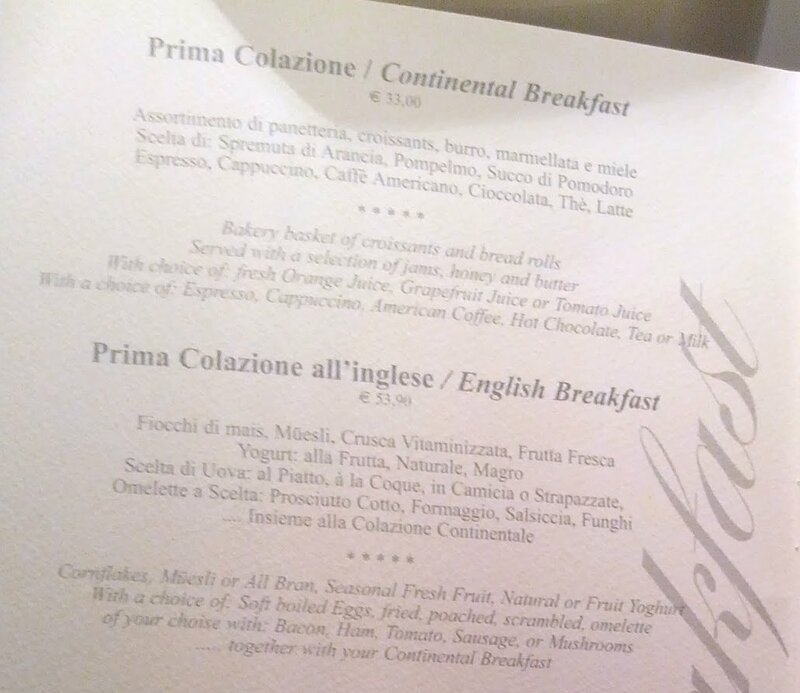 I realize that's hard to read - it was €33 for the Continental Breakfast and €53.90 for the non-Continental one. 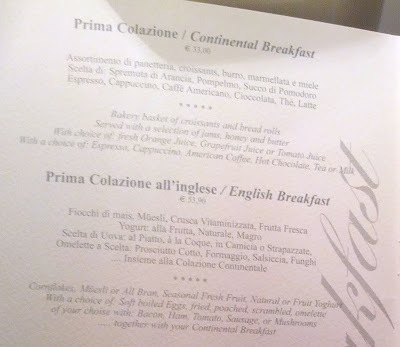 The €26 Caesar Salad and €12 Diet Coke were other notable highlights. Second, my room had to be the absolute worst hotel room I've ever had in terms of power outlet availability. 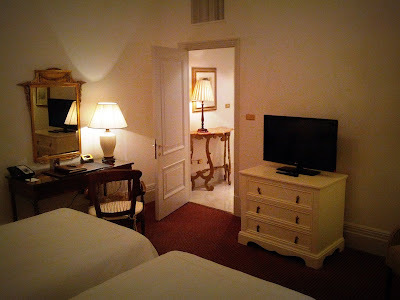 As far as I could tell, there were two outlets in the bedroom - one at the desk, and one that the TV was plugged into. At any other hotel I can think of, you can at least unplug a lamp if you need to plug in 2 devices at the same time. However at the Eden, the lamps are wired directly into the wall, so there isn't even an outlet. This might seem like a minor issue, but it's one of my major pet peeves when traveling (especially for work) - and considering that the room is normally setup with 2 single beds, I can't help but wonder what the second person is supposed to do while the first person charges their phone over night. 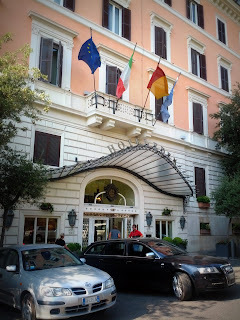 I liked this hotel, but next time I'm in Rome I'll probably check out some other options like the Westin Excelsior or the St. Regis Rome. Do you have any favorite hotels in Rome that you'd recommend? If you liked this post, why not sign up to receive free blog posts via your favorite RSS Reader, or get a daily summary via email - then you'll never miss out on the latest Food, Wine, and Miles! Come on JBell. You were in Rome. Power outlets are not a priority. Pizza is. I really hope you had some Roman pizza while you were there. This hotels sounds like a major step up from the hotel Scott and I stayed at in 2005, which can best be described as a brothel. Live and learn.